Cervical discs refer to the jelly-like cushions present between the cervical vertebra bones of the spine. These intervertebral discs are essential for absorption of shock. Injury, infection or the normal ageing process can lead to abnormalities in these discs. The disc can move out of its position and become herniated or with the passage of time, bone spurs or osteophytes can develop, creating further pressure on the spinal cord and compressing nerves. Degeneration of discs with age can also cause pain in the neck; as it presses on nerve roots, it can lead to neurological symptoms that cause headaches, pain, numbness, tingling and weakness or stiffness in the neck and radiating out into the arms. Non-invasive treatments include pain medications, physical therapy, and sometimes, injections directly into the spine. If the symptoms still persist and are getting worse after 2-3 months of this therapy, then your doctor might suggest surgery. The surgical method used will depend on the location of the disc abnormality, the type of disc abnormality and the health and age of the patient. The traditional surgical method for treating disc disease is through anterior cervical discectomy and/or fusion surgery. Here, the entire disc is removed and the gap created between the two vertebral bones is filled with a bone graft. This removes the pressure on the compressed nerves and relieves pain. A plate with screws is then applied to the two bones to assist in their fusion and providing greater stability to the neck. This procedure however restricts neck movements. An improvement on this method is the artificial disc replacement procedure. 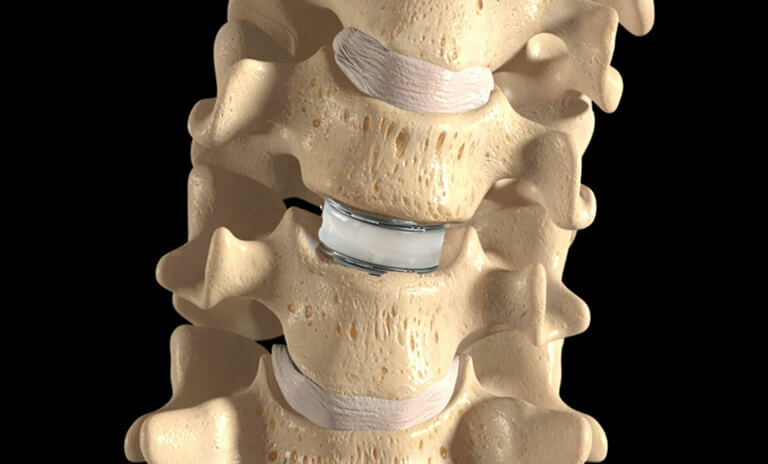 Artificial disc replacement, or total disc replacement is a surgical procedure in which damaged intervertebral discs in the spinal column are replaced with artificial devices. Though duplicating the natural disc in its form and function is a challenge, several different types of cervical discs have been developed to help reduce neck pain. This method involves placing metal implants on the surfaces of the vertebral bones touching the damaged disc. These metal implants can slide effortlessly over one another or a medical-grade plastic can be placed in between them to further enhance movement. The benefits of this method include a lack of restriction on neck movements; absence of a stabilizing plate here also means less irritation on the esophagus and reduction in swallowing difficulties – both are problems associated with cervical discectomy with fusion surgeries.